Monroe High School defeated Sauk Prairie High School, 170-165, to win the Finance and Investment Challenge Bowl State Championship in Milwaukee on April 27, 2016. The outcome of the contest came down to the final question. It was the first appearance in the state title match for either school. Teams from DePere and Rhinelander rounded out the final four. Pictured above, left to right, are: David Mancl, Executive Director of DFI’s Office of Financial Literacy; Richard Entenmann, President of Asset Builders of America; and members of Monroe team: Silas Setterstrom; Sam Nicholson; Jack Sabatke; Bishop Yoder; teacher Sherri Hendrickson; and Dominick Curtiss. The Finance and Investment Challenge Bowl is a financial literacy program for high school students, teaching a wide range of financial literacy topics that align with Wisconsin’s Model Academic Standards for Personal Finance as well as the Jumpstart National Standards. The FICB culminates in a live, college-bowl tournament where teams compete to determine regional champions. This year more than 600 students competed in seven regional meets held across the state. The Wisconsin Department of Financial Institutions (DFI) is a sponsor of FICB. More information can be found at http://www.ficbonline.org/. 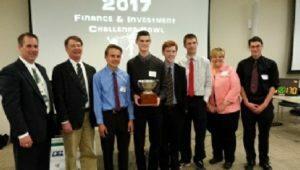 Rhinelander took three teams to the state Financial and Investment Challenge Bowl (FICB) in Milwaukee on Wednesday, April 27. Sixteen teams from across the state competed in a live, college bowl style tournament consisting of 30 questions. The questions focused on a range of finance-related questions, with half of the questions asked about personal money management, and the rest were about current events, general business terms, technology, economics, and insurance. Alison Kubeny, Bryce Young, Andrew Padgett, and Max Holperin made Rhinelander’s Team I. Jeff Chizever, Mitchell Modic, and Jacob Piesecki competed at State as Team II. The third team consisted of Adam Mueller, Henry Kipper, and Jon Fox. For the first competitive round, RHS Team I competed against Marshfield and won 125-100. RHS II also won against Pius XI from the Milwaukee region, while RHS III lost to Monroe. During the 2nd round it was RHS II’s turn to go against Monroe, and they lost on the tie-breaking question. Rhinelander 1, however, beat Racine Case 1 to make it to the Final Four. Ironically, Rhinelander 1 had to go against Monroe again, but was beaten. The final two teams, Monroe and Sauk Prairie, competed in the finals, and Monroe won on the last question. Ironically, the two teams had already competed against each other in the Madison regional finals.